Who really needs a reason to stay at Disney’s Polynesian Village resort? It is a deluxe resort after all, on the Magic Kingdom monorail and is one of the nicest places to stay on Disney property. But, it can be pretty expensive, and if you are going to splash the cash, you need some decent reasons to justify spending all those Disney dollars. While there are more than three reasons why you should stay at Disney’s Polynesian Village Resort, there are three big reasons you should consider this your Disney home. Polynesian Vibe – All throughout the resort, from the lobby in the Great Ceremonial House to the tiki torches that light the walkways at night all the way to the individual guest rooms, the entire resort is full of that relaxing Polynesian feeling you get on the islands. There isn’t anything quite like it at Disney. You really feel you are on a Hawaiian vacation while at the resort. Personally, I want my resort to be opposite of the theme parks. In the parks you are overstimulated with sights, sounds and motion, and at the resort, I want it to be as restful and relaxing as possible, and the Polynesian Village Resort fits this perfectly. Polynesian Village Beach – While you won’t have access to the water, the beach is still available and fantastic. While I am not sure I would spend much time on the beach normally, at night it becomes the place you want to be. You have a perfect view of the Magic Kingdom over the Seven Seas Lagoon, and therefor a perfect view of the nightly fireworks. No need to bother with the crowds, just find yourself a hammock and relax. Plus, they even pipe in the music for the fireworks show right there onto the beach! Oh, and stick around for a bit after the fireworks (or possibly before, depending on the night) for the nightly Electrical Water Pageant that will float by around 9:00 every single night. While the effectiveness of the beach for viewing fireworks and the water parade have been reduced by the new Bora Bora Bungalows that have been built out into the water, there still are some viewing areas that are pretty decent. Lava Pool – Several years ago, Walt Disney World massively upgraded the main swimming pool at the Polynesian and themed it as a giant volcano. Well, the upgrade wasn’t enough, and the pool has been completely overhauled in the last year into what is now one of the best pools outside of Stormalong Bay at the Beach and Yacht Club resorts. The Lava Pool features a fantastic slide located inside the volcano, wonderful spas as well as a perfect view of Seven Seas Lagoon and the Magic Kingdom. Where else can you swim and have such a view? Oh, and don’t miss the Barefoot Bar where you can get your favorite Polynesian inspired drinks to help you relax just that much more. Dole Whips at your resort, without the line you find in the Magic Kingdom. Stop by the Pineapple Lanai in the lobby and grab yourself a Dole Whip or Pineapple Float and head out to the Lava Pool. While not quite as good as enjoying it in the Tiki Room, not a bad option at all. Monorail – The Magic Kingdom monorail stops right at the Polynesian, allowing you quick access to both the Magic Kingdom and Epcot. 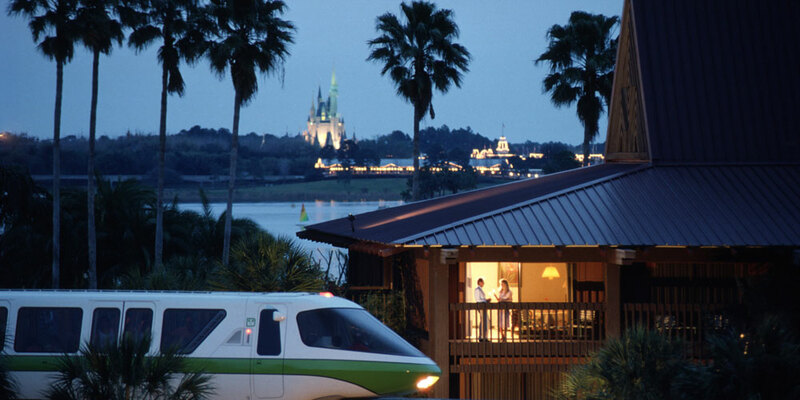 Plus, there isn’t anything quite as special for kids (and adults) as riding the monorail. Restaurants! – Disney’s Polynesian Village Resort features two of the best resort restaurants in Walt Disney World, ‘Ohana and Kona Cafe. While nither fall under the “signature” restaurant label, both are fantastic and extremely popular. 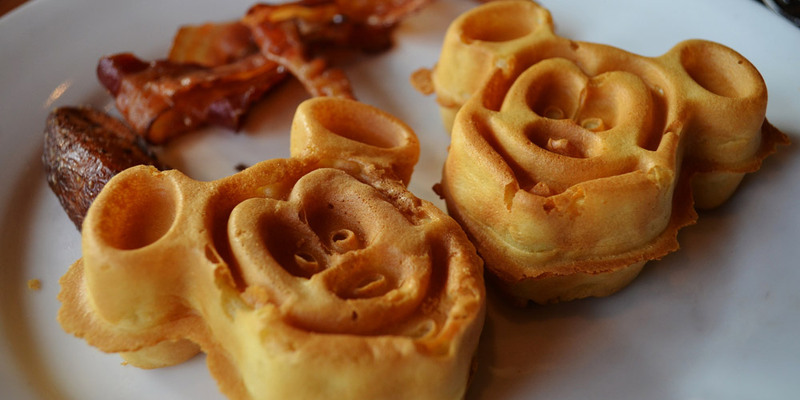 ‘Ohana features an all you can eat menu where the food is delivered to your table, and also features your favorite Polynesian Disney characters at breakfast (Lilo and Stich of course. Mickey and Pluto show up as well in their vacation attire). Kona Cafe is more of a standard restaurant, famous for Tonga Toast for breakfast. TONGA TOAST!!! I am sure I could come up with plenty more. Why do you stay at Disney’s Polynesian Village Resort? In Disney’s Polynesian Village Resort at Walt Disney World, there are two table service restaurants available for your Disney dining pleasure. Located basically next to each other on the second floor overlooking the lobby are Kona Cafe and ‘Ohana. These two restaurants are nearly complete opposites, but which one is the best for your family? Kona Cafe serves all three meals each day, breakfast, lunch and dinner, all three meals are a la carte, and are available with one table service credit on the Disney Dining Plans. 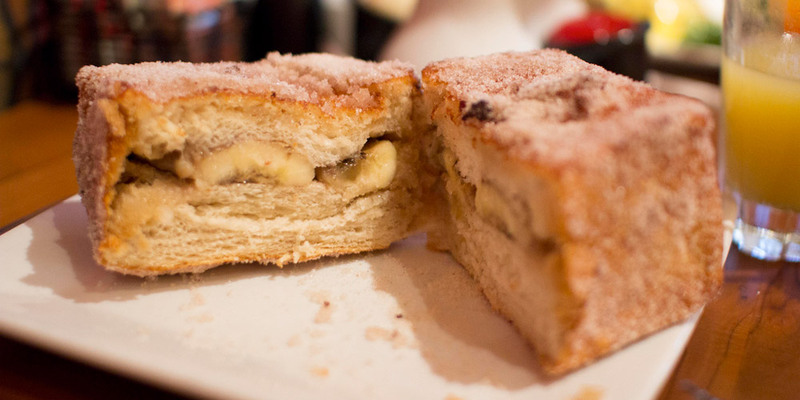 Breakfast is home to the world famous Tonga Toast, banana-stuffed sourdough french toast rolled in cinnamon sugar. If you haven’t had Tonga Toast, you haven’t been to Disney. In addition to Tonga Toast, it also serves other Polynesian inspired entrees such as Macadamia-Pineapple Pancakes, the Big Kahuna (French Toast and Pancakes topped with Pineapple Sauce and Macadamia Nut Butter, Eggs, Home-fried Potatoes, Ham, Bacon, and Sausage) and my favorite, The Samoan (Poached Eggs with Hollandaise served over Smoked Pulled Pork Hash). If your mouth isn’t watering right now, there is seriously something wrong with you. Oh, and don’t miss the “Liliko’i Juice”, I wish I could bathe in that stuff. Lunch features Asian and Polynesian inspired appetizers and entrees. My favorite appetizer is the Steamed Pork Buns, crazy good. Entrees include a Grilled Ahi Tuna Sandwich, Barbecue Pork Tacos and Polynesian Plate Lunch with either pan fried chicken or teriyaki steak. Don’t forget dessert, so many delectable options. Dinner is the hidden gem of Kona Cafe. Appetizer options are similar to lunch, but with the addition of Sushi to the many. Entrees are much more dinner like, and feature Pan-seared Duck Breast, Grilled Curry-crusted Lamb Chops and Kona Coffee-rubbed Pork Chops. I dream of the Banana-Chocolate Crème Brûlée dessert. Kona Cafe is a fantastic, hidden gem of a restaurant. The food is top notch, and it makes for a great break from the Magic Kingdom. Breakfast is an all you can eat, pre-plated meal that includes scrambled eggs, sausage, bacon, potatoes and some magical bread that you just can’t get enough of. This is not a buffet, but is all you can eat. Just ask for more of whatever it is you want, and they will keep bring it to you. Along with the food, you also get Disney characters! Lilo and Stitch host you for breakfast, and even stop by your table to say Aloha. Please note, if you are crunched for time, DO NOT plan on breakfast at ‘Ohana. For some reason, they always seem to be behind, and wait times can be 60 – 90 minutes, even if you are on time for your reservation. Dinner is also all you can eat, and like breakfast, is brought to your table. I have never had to ask for more of anything, but you always can. Dinner starts with an amazing pineapple-coconut bread that would suffice me for my entire meal. Whoever makes the bread for ‘Ohana must be using dark magic. Appetizers feature Pork Dumplings and Wings, followed by skewers of Sweet-n-Sour Chicken, Spicy Grilled Peel-n-Eat Shrimp and Szechuan Sirloin Steak. You better leave room for dessert, because it is the highlight. The Bread Pudding à la mode with Bananas-Caramel Sauce is world famous, and not to be missed. While there aren’t any characters at dinner, there is some nightly entertainment that usually involves kids walking around the restaurant to music. ‘Ohana is a great place to eat where you will get a wonderful experience with your family, not have to make too many choices and you will get some of the best bread and desserts known to man. While ‘Ohana is without a doubt more popular, Kona Cafe is the better restaurant. Much wider choice of food – Kona Cafe offers quite a few options for all three meals each day, and everyone in your party can choose exactly what they want rather than everyone at the table having to eat exactly the same thing. We do that at home every night, this is vacation! Better food – Since ‘Ohana serves everyone the exact same thing, they obviously make everything in super large batches, while Kona Cafe hand makes your meals, and you can tell. Tonga Toast – While the Mickey Waffles at ‘Ohana are ok, they are nothing compared to the Tonga Toast at Kona Cafe. They are a right of passage for all Disney fans, and for many, a MUST EAT every single trip. Easier reservations – ‘Ohana is quite hard to get in, unless you want to take your little kids over to the Polynesian at 9:45 at night for dinner. No one wants that. In and Out – I have rarely waited to get into Kona Cafe, and service is usually very quick. ‘Ohana on the other hand always has a lengthly wait, and meals there seem to take forever. Well, there you go, Kona Cafe is my winner. Which restaurant do you choose and why?